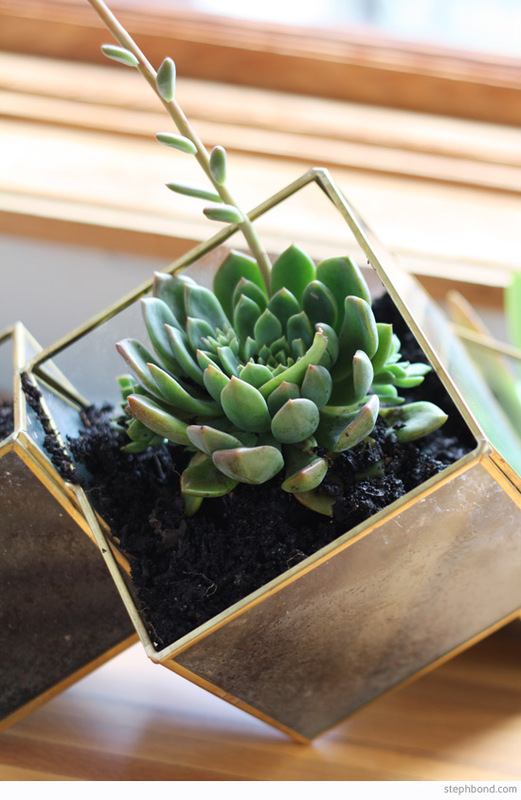 I received this beautiful copper and glass terrarium from West Elm and have been enjoying it's interesting angles sitting on my sideboard, but thought the kids would love to help me turn it into a real terrarium with gorgeous succulents. 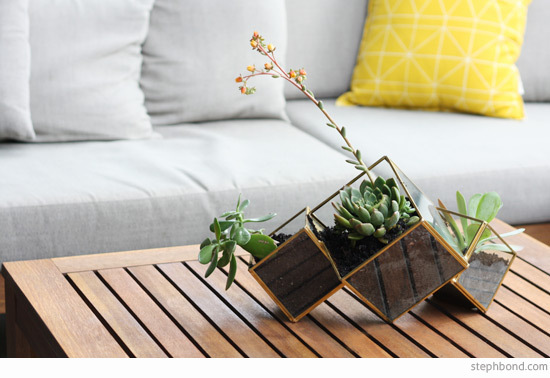 It's a really simple process if you have succulents on hand. We bought one plant (the amazing flowering centre succulent), had a pup on our Flapjack (right succulent) but also propagated our own really easily (left succulent). We asked a friend with a Jade plant (money plant) for small clippings. We then popped them in small vases with plain water, which look great all over the house! It was really fun for the girls to watch the clippings sprout roots. Once the roots were fairly substantial, we set aside fifteen minutes to plant out the terrarium. Make sure you do this outside, as it can be a little messy. 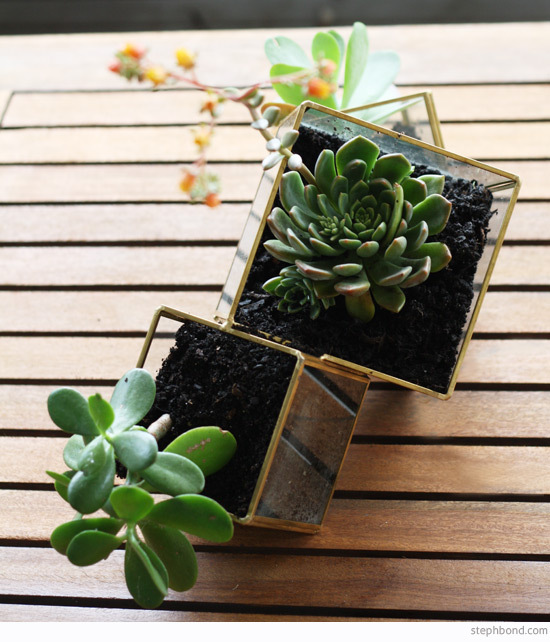 Simply place a few scoops of good quality potting mix into the bottom of each cube, pop the succulent clipping, pup or plant in, and surround with more potting mix. Make sure your potting mix is somewhat moist to help the roots take hold. We used a fair amount of soil, as our plant and clippings were large, but you could use just a small amount and get more plants in each cube. Voila! 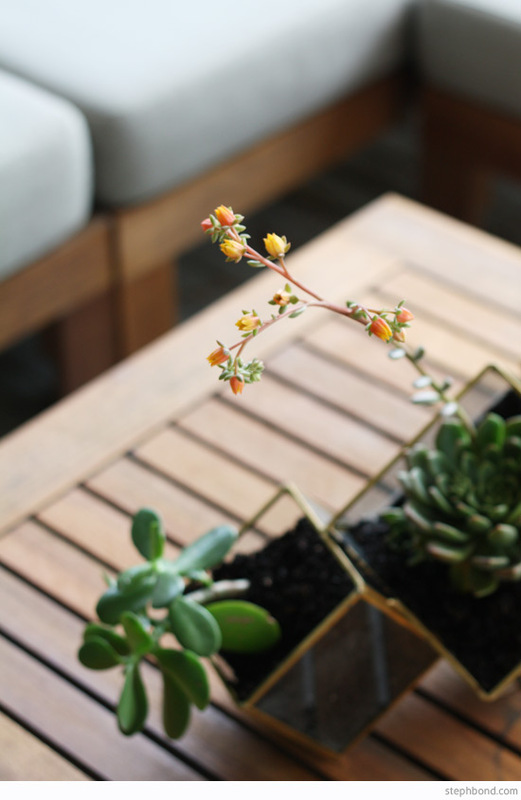 You won't need to water the terrarium much as succulents don't like to be wet, and each cube develops its own microclimate, with moisture forming on the sides of the cube, and then returning to the soil. We love our terrarium even more now that it's proudly showing off these great plants, and it's a great mini science lesson for the kids. 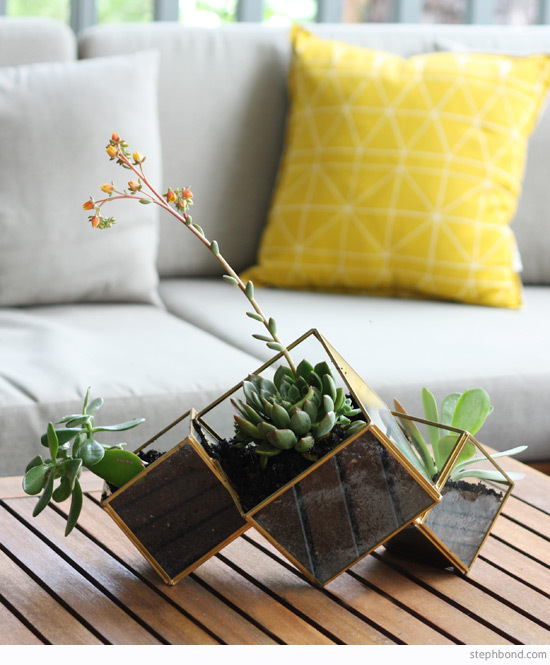 You can find the cube terrarium at West Elm.